You see their photo on your fridge every day. You pray for them while stuck in traffic. You wonder if the words you write really sink in; or if what you’re doing even makes a difference. 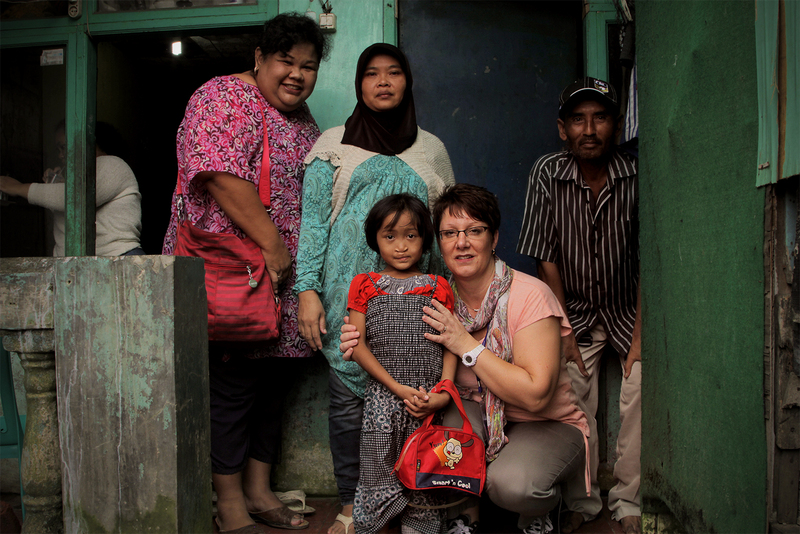 Three Newcastle women had all these questions answered and more when they met their precious sponsored children in Indonesia. I remember sitting in my church eight years ago listening to a presentation about Compassion and hearing stories about kids—not too far from Australia—who live in extreme poverty. When I went to the Compassion table, I looked at the faces of beautiful children from Indonesia and I saw Nova. She was seven years old and my 18-year-old self thought: “I can do something small to help this little girl”. I never imagined I would get the chance to meet Nova face-to-face. I never thought that dream would become a reality, but it did. Meeting Nova I was really excited, but also didn’t know what to expect. I cannot adequately describe the impact meeting her had on me. When I saw her, I gave her a big hug and we had a few hours to hang out. She brought all of my letters with her and told me—through the translator—how much of a difference these letters and prayers made in her life. I got the chance to give her some presents that I’d brought from home and she gave me the cutest gifts she had made at the project. That moment of exchanging gifts was really special and actually transcended any language barrier. The most amazing moment was when I got to pray for her. It was in that moment, accompanied by tears and tissues, when I realised the eternal impact that sponsoring Nova has had. It was overwhelming to realise one small decision eight years ago in a church in Newcastle has transformed the course of a child’s life. Nova is on a different trajectory from where she was when I first saw her photo at the Compassion table. She is 15 years old, full of hope, joy and confidence in Jesus. She has a dream to go to university; an opportunity that so many kids in her community would never get. She has been released from poverty in Jesus’ name and I have had the amazing privilege to be a small part of it. When I met my sponsored child Suci, I had an overwhelming sense of God’s presence and purpose for reaching the poor. Through Compassion and more humbly, through me, God was loving children in poverty right there in Indonesia. It was very emotional to think God had connected me to this child and family who live in the most challenging of circumstances. Walking into their home, it was impossible to not notice the ground made of dirt and how bare it was; just a few well-worn processions and furniture. The walls were crumbling and the roof had holes. There were a few grimy mattresses on the floor at the back of the room and an open window without glass. Only a curtain separated the sleeping area from the front of the room, to give some privacy. I can only imagine as a mother myself how Suci’s mother would have tried to make it as comfortable as possible for her family and how helpless she must feel. I was hit with how her mothers’ heart must be burdened with the reality of not being able to provide for her children. I was incredibly sad to hear her father scavenged for a living, collecting recyclables to sell for meagre pittance. I felt an overbearing responsibility for them and felt God had brought this family to my attention. But then I also knew this family, had received real hope from the local church running the Compassion program. I could see Jesus working through the dedicated project staff to love and support this family. I was honoured to be able to pray for them in their home, stating the words ‘in Jesus’ name’. Later when the mother came with Suci to church, I was amazed that the work of Compassion is able to transcend religion and ethnicity and introduce families to the gospel in a non-threatening way. Leading up to meeting my sponsored child Juan, I felt really nervous. I didn't know what to expect and I was worried about the language barrier. Eight of us arrived at Juan’s home and I didn't want to overwhelm his family, so I asked if they would like some of the group to wait outside. However Juan’s dad didn’t hesitate; he ushered us all through the front door! We sat in the run-down room that made up the whole of Juan’s family home, housing all six of them. Juan’s family lived in a rough neighbourhood. They did not have many possessions, his parents didn't have stable employment, but despite all this they were full of joy. It was a stark testimony that unexplainable joy that can only be found through the love and hope of Jesus Christ. It was an incredible time of interacting with the family and playing some games with the kids. The fun was real and tangible even though we could hardly speak two words to each other. As I said goodbye I gave each family member a hug. Juan’s mother and father gave me a beautiful scarf as a gift and his father expressed to me with tears in his eyes how appreciative he was of what I was doing for Juan. This was really overwhelming for me—as a new sponsor I didn't really feel like I'd done much for Juan, but what didn't seem like much to me meant a great deal to the family. The hope these families receive through Compassion is life-changing for them, and so often an answer to their prayers. I had plenty of questions for myself walking away from this experience, it was a real reality check that I am still processing. But the impact of this trip will never leave me. Have you ever wanted to meet your sponsored child? See if one of our Insight Trips is heading to your sponsored child’s country, or organise to go and visit them yourself—just be sure to organise it with Compassion!